Before going there I didn’t really know a lot about KwaZulu Natal. I’d heard of it. Of course I had. It was the location of a very famous and very bloody battle between the British Army, Boer commandos and Zulu warriors. However, I’d always written if off as a place just for history and war buffs. But I have to admit when I finally visited I was more than pleasantly surprised by what I found. KwaZulu Natal (or “KZN” as it’s fondly referred to) is sandwiched between the mighty Drakensberg Mountains to the west and to the east, one of the best coastlines of all South Africa, lapped by the warm waters of the India Ocean. Inland the green, rolling central area is reminiscent of England’s countryside, whilst to the north are the beautiful waterways and forests of the St Lucia wetlands. Throw in some wonderful wildlife viewing, the intrigue of the Battlefields and new direct flights from Heathrow with British Airways (three times weekly commencing the end of October) and you have a place that is well worth a visit. The cosmopolitan city of Durban, South Africa's third largest city, is the gateway to KZN. It has a heady mix of cultures with local Zulu ladies weaving beaded products on the streets next to Indian temples, spice markets and skyscrapers. A half day city tour is enough to get a feel for the place and, on mine, I learnt that in his early twenties Ghandi arrived in Durban and stayed there for 22 years. I also learnt that the city has the largest Indian community outside of India and sampling a bunny chow (a large bread roll hollowed out and filled with curry) is a must. I personally wouldn’t stay in Durban itself and would instead head to the seaside suburb of Umhlanga Rocks, where you can look out from the balcony of your colonial style hotel over the crashing ocean and the iconic lighthouse. Here you have a pretty promenade and plenty of restaurants and shops. It’s a perfect place to spend a few days at the start or end of your trip. The Drakensbergs form South Africa’s highest mountain range and are so called because the rising peaks resemble the spikes of a dragon’s spine. The area is vast and stunning with a huge biodiversity and it’s a great place for outdoor activities. Here you can rock climb, abseil, go white water rafting, enjoy gently riverside ambles or take challenging hikes that lead you to spectacular views. Another fact I learnt on my trip to KZN, and maybe I should have already known this, is that on 5th August 1962, on an unassuming piece of road north of Durban, armed apartheid police flagged down a car in which Nelson Mandela was pretending to be the chauffeur. It was here that Mandela was captured after 17 months on the run and proceeded to disappear from public view for the next 27 years. The site is now home to the Nelson Mandela Capture Site exhibition and a powerful sculpture, which is quite possibly one of the best I’ve seen, and definitely worth a visit if you are driving by. The extraordinary sculpture comprises 50 steel column constructions, each between 6.5 and 9.5 metres tall, which look like nothing until you stand in the correct position on a path in front of the sculpture at a distance of 35 metres. At that spot, a portrait of Nelson Mandela, looking west, comes into focus as the 50 linear vertical units line up to create the illusion of a flat image. I will admit that I wasn’t really looking forward to sitting for hours listening to a boring history lesson about the titanic battles that took place in the area. But luckily for me I had the opportunity to stay at Fugitive’s Drift, a wonderful lodge that sits serenely above Buffalo River between the battlefields of Rorke’s Drift and Isandlwana. Here the guides are second to none and, with the absolute passion of the Lodge’s founder David Rattray, they reignited the fear and courage of the British soldiers as they bring the battles to life. Even I was moved by the thought provoking stories told as we walked around the battle sites and my spine tingled as our guide hollered the Zulu’s haunting tribal chant, knowing the brave soldiers would have heard this sound getting louder and louder as thousands upon thousands of Zulu warriors approached. The battle of Rorke’s Drift was one of the greatest military disasters of British colonial history, but out of it came the most Victoria Crosses awarded in one day, with eleven handed out to the gallant men. 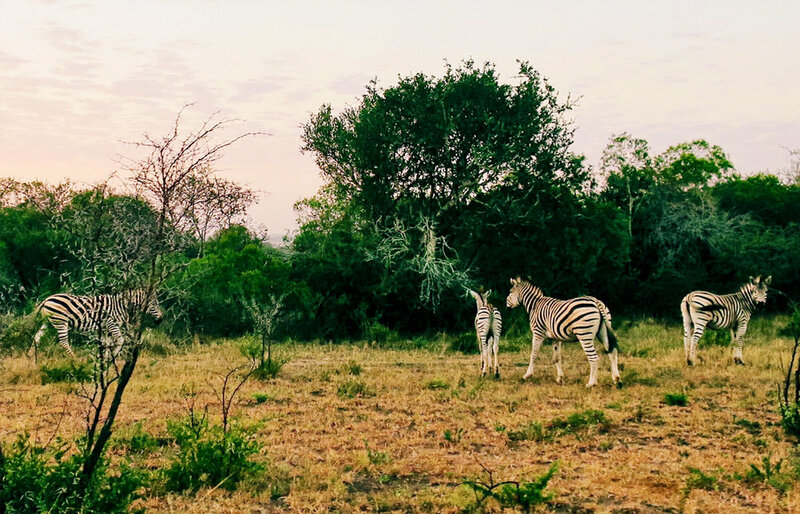 In the north of the country you’ll find KZN’s non-malaria safari region where I stayed at &Beyond’s Phinda Game Reserve, which has just 6 luxury game lodges on 23,000 hectares. Here you are almost guaranteed sightings of most of the coveted Big Five in a few days. Not because the animals are in any way tame, but because with only a maximum of 120 guests and guides in constant contact via radio, it makes it simpler to find the animals. In my 2 days on safari I spotted lion, elephant, giraffe, buffalo, cheetah, leopard, zebra, white rhino and even the more elusive black rhino. Also Phinda, unlike many reserves, has seven distinct biospheres giving a wonderful diversity in scenery, vegetation and species. One of those biospheres is the ocean and although you feel in the middle of the African bush, you are actually only 45 minutes from the coast (or 15 minutes by light aircraft), which means it’s possible to spot the Big Five before breakfast then head to the deserted white beach of Sodwana Bay for diving, snorkelling, whale watching (in season) or horse riding, before a luxurious beach picnic under a shady canopy all set up by the Phinda staff. If you’re on your second (or third or fourth) visit to South Africa and are looking for something different, you really should consider KwaZulu Natal. It’s a perfect place to do a self-drive and you can easily combine all the highlights mentioned above in a relaxing two week trip, which will be made even easy with the first ever direct flights from the UK (London Heathrow) to Durban starting in October. If you’d like to know more about a trip to KZN or elsewhere in Africa, then please do get in touch.